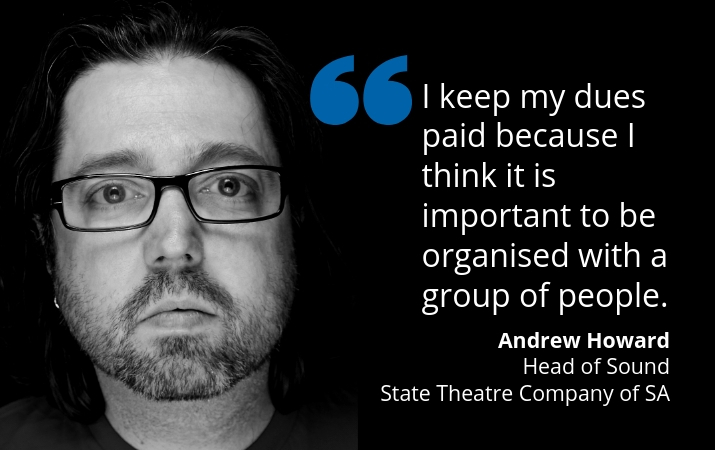 Andrew Howard is Resident Sound Designer and Head of Audio at the State Theatre Company of South Australia. He talks about his career and why he’s a MEAA member. How long have you been working in the industry and how did you get your start? I started working in the theatre industry as a composer and sound designer in 2000 with experimental theatre company The Border Project. The first show with that company didn’t come until 2002 when we secured a small amount of funding to do Heiner Muller’s Medea Material. I also started working as a sound engineer at the Adelaide Festival Centre in 2000. I initially approached Jane Rosetto (Head of Audio AFC) for work experience and I was put on the books as a casual. Due to my theatrical background Jane started putting me on to operate shows for State Theatre Company of South Australia. I operated pretty much every show of theirs for about five years along with all of the other things that come with working in a major arts centre such as festivals and one nighters. During this time I continued to compose and sound design for independent theatre companies. I didn’t get my break as a composer/sound designer on the main stage until 2008 when Geordie Brookman gave me the opportunity to design and compose Martin Crimp’s Attempts On Her Life for the State Theatre Company. I’m thankful to both Geordie and Jane (as well as a whole bunch of others) for where I am at now in my career as the Resident Sound Designer and Head of Audio for State Theatre Company of South Australia. A typical day/week for me is incredibly varied. If we are in a rehearsal period and I am designing, then those days will be filled with sourcing sound effects and composing music as well as doing design drawings and schematics. I also have to source all of the audio hire equipment for each particular show. Once we are in the theatre then it is my responsibility to make sure the sound system is installed to my or other sound designers’ specifications. I am also responsible for programming the consoles and QLab if I am designing. If I am not designing then I am in charge of the day-to-day technical running of the company, including setting up rehearsal rooms, equipment maintenance, liaising with venues that we play in locally, nationally and internationally, IT troubleshooting and sound, video and lighting installs as well as mixing for any events we have. I also like to stay as up to date as possible with show control software and I am still learning new things on every show I do. The best thing about my job is that I get to create theatre with great people on a day-to-day basis. On top of that the State Theatre Company has a wonderful team of people and it really makes creating theatre an always pleasurable undertaking. No matter how technical the show everyone has each other’s backs when it comes to promoting a calm and stress free environment in what can at times be stressful when working within the time constraints that we have. I would say the highlights for my career thus far have all come in the past few years starting with building an 800 seat outdoor venue for Neil Armfield’s Secret River during the 2017 Adelaide Festival. It was such a massive undertaking for a company of our size to do but it was incredibly well worth the time and effort to do this for a sell-out house every show. It was also a really great show and a great bunch of people from Sydney Theatre Company joined us for the duration. The second was working doing a co-production with Frantic Assembly from the UK on Andrew Bovell’s Things I Know To Be True and having my sound design be toured internationally. The show toured for six months in the UK and unfortunately has only had one outing here in Australia. Finally being the Australian Associate Sound Designer on the behemoth of a sound show that was 1984. I had never seen a QLab cue list so intense; it had over 2000 cues in the cue list and really took a look of brain space to manage that plot in each venue we played around the country. What advice do you have for young people wanting to break into the industry? Never stop learning and always be good to people. Why did you join MEAA and why is it important to be a member of the union? I joined the union when the bulk of my work was predominantly crewing at a major centre. I keep my dues paid because I think it is important to be organised with a group of people.